“We want to live with you!” says Plush Giraffe. Mindi Scott offers an absorbing, layered glimpse into the life of an everygirl living a nightmare that no one would suspect in this unforgettable powerhouse of a novel. Praise For Live Through This . . . Such well-deserved praise! 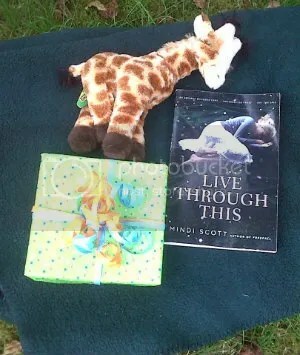 Along with the ARC, Mindi is also giving away the most adorable stuffed giraffe (which will make total sense once you read your arc, but until then, doesn’t it look so snuggable? ), and *cues dramatic music* a GIFT. OF. MYSTERY! Honestly. Who can resist a mystery gift?? Let’s review! One enviable winner will get three awesome (and mysteriousssss) prizes! So, if you want the haul for yourself, check out the details, including all the ways you can enter, in the Google form below. Posted in: Not a Review, Who Knew? Crushes on Boys (and stuff)!